On this page you can find HTML templates made with frames, consisting of 3 frames each. It's the same template in four different colours. 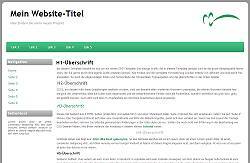 The four HTML templates are suitable for beginners. Modern minimalistic template with two columns, completely designed with CSS (except for the sample image in the right top, which can be changed to your own image). The template automatically adjusts to 95% of the width of the user's screen. Tne navigation column has a preset width of 220 px, the main column is variable. Speciality: rounded edges and gradient of navigation bar and header lines are done with CSS3, which all modern browsers can show. If older browsers are used the look is still neat, only no rounded edges and no gradient then. Same template like 13_1 but in different colours.